Belcam Kids Body Wash and Shampoo is a healthy choice for kids! It is a hit-favourite with the kids and is gentle enough for everyday use. Make your kid's bath a seamless experience with this two-in-one product. It doesn't irritate the delicate skin of your child and is safe and tested under many conditions. 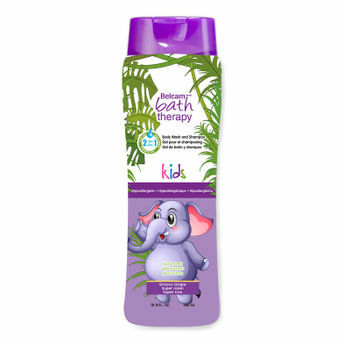 If your child loves the sweet tart flavour of grapes, you should definitely include this in his/her shower routine! Belcam Bath Therapy 2-in-1 Body Wash and Shampoo will clean your little one from head-to-toe. Formulated without any unnecessary ingredients to reduce the toxic load on the child's delicate body, this product is ultra mild. Why is it good for your baby? Taking care of a baby is a huge task but it can be made easy and enjoyable if you know what baby care products to use. Babies are blessed with delicate skin and hence, the chances of them developing dry skin, rashes or skin infections are much higher. They have a greater surface to mass ratio, hence, the body heat and moisture can be lost when exposed to excessive cold, dry heat or warm air. To prevent such conditions it is advisable to use grapes as it has anti-inflammatory properties. It will leave your childA s hair and skin smooth, soft and hydrated. About the Brand: Belcam Bath Therapy story begins with a genuine love and appreciation towards bathing. Where else can you wash away the day and achieve blissful relaxation without breaking the bank? In Belcam's quest for perfection, they have spent countless hours researching and developing a bathing solution that checks all the boxes. It is your source for 'Total Body Care'! Whether you are looking for high-quality bath products, top-selling versions of the latest designer and celebrity fragrances or hair care and skin care, Belcam has them at a price you can afford! Its focus is to provide you with the very best products, the most competitive prices and the best possible service. BelcamA s key brand, Belcam Bath Therapy, provides healthier personal washes suitable for the entire family. There are no artificial colors in any of the Belcam Bath Therapy products, and they are also gluten free, vegan, pH skin compatible, paraben free, soap free and biodegradable. Belcam has been, for several years, shipping bath products throughout the world and has garnered the trust of loyal consumers. Explore the entire range of Shampoo available on Nykaa. Shop more Belcam products here.You can browse through the complete world of Belcam Shampoo .